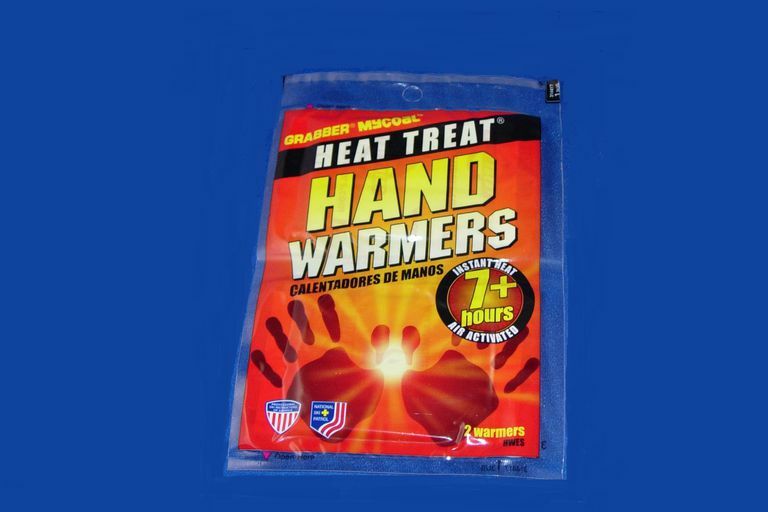 Ban frigid fingers with this great little packet of gentle heat. If you need to be out in the cold, Grabber Mycoal Hand Warmers are essential. Keep your hands warm simply by opening the packet. It heats up as a simple chemical reaction with the air produces warmth. You can carry it in your hand or pop it into your mittens. Or, put it in your pocket for a truly warm pocket to warm up your hands. It's a great way to keep your fingers warm on a walk. A natural reaction produces gentle heat. The warmth lasts for seven hours. Carry them in your hand, in your mittens, or pocket. Sandbag-like shape and feel are comfortable. Get heat when you want it, wherever you may be, no microwave or other heat source needed to warm them up. It is not reusable, you have to dispose of it after one use. Grabber Mycoal hand warmers are a great comfort item for winter walking. If you are like me, your hands start off cold and can take 15 minutes or more to warm up on a cool day, let alone a truly cold day. With the Grabber hand warmers, you can start off with warm hands and keep them warm. You can also use them at any time. If your hands get cold while you are out on your walk, you can activate the packet then. You don't have to start out with it already hot. The hand warmer works with a simple, natural reaction with iron, charcoal, salt, and water - basically, fast rusting of the iron. The heat is gentle and constant - they really do stay warm for 7 hours! Compared to other options, the fact that they keep heating for seven hours compared with minutes for something like a microwaveable seed bag is a big advantage. The Grabber Mycoal hand warmers come in a two-pack. I often economize and just use one at a time. Simply open the packet to air and you can carry the little sandbag-like warmer in your hand or in your pocket, or pop it into your mittens. I wear those cheap stretchy knit gloves, and this handwarmer is perfect for keeping my hands warm by carrying it in one palm and switching it every few minutes. It seems like it is harder and harder to find mittens as the market has switched to gloves with smartphone-texting-friendly fingers. But gloves don't keep your fingers as warm as mittens. This makes it even more necessary to have a heat packet to use for keeping your fingers warm. These are single-use items. You'll need to toss them away in the garbage after using them, you can't recharge them. That can feel wasteful, so it is a drawback. I carry them in my car and in my pack to have available whenever I might need them. They have been a lifesaver after a winter half marathon walk. Often your hands will be warm enough while you are running or walking briskly, but once you stop you cool down very fast. Having a heat packet to warm up my hands made a huge difference once I crossed the finish line and had to wait for a shuttle to my car. You can find Grabber MyCoal hand warmers at major retailers during the winter season, including warehouse stores such as Costco. Look for them also in outdoors, fishing, and hunting stores. You can also search for them at online retailers.